You can’t scrub down the surface of windows in the same way that you might scrub out a stain or wipe down a tabletop. 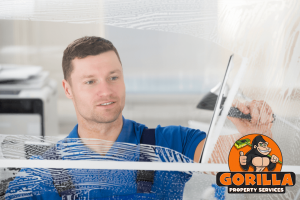 Wiping too briskly or using the wrong cleaners can be hard on your windows or ineffective against streaks or stains. Finding a middle ground for your window cleaning can take a long while with a lot of trial and error. If you don’t have time to practice different cleaning techniques, save yourself the trouble by calling a Gorilla. Our Bedford window cleaning can be made to outfit your home or business with expert service every time. How High Can We Go ? Cleaning windows on a ground floor seems straight forward enough but as the glass gets higher, things become more complicated. The most obvious method of reaching elevated windows, is to use a ladder. Positioning a ladder and balancing weights can leave you with damage frames or even broken glass. Instead of taking chances with self window care, let a Gorilla do it for you. Whether you are dealing with ground floor grind or higher levels, our Gorillas are outfitted with all the tools to reach your windows up to four storeys. When addressing the problem areas of your windows, the right tools can make a world of difference. 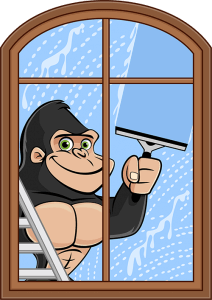 For lower level windows, our Gorillas operate by hand, using rubber squeegees and eco-friendly cleaners. These items eliminate static shocks brought on through friction, as well as cleaning out angled areas of windows. For those panes that are out of reach, our Gorilla Mobiles are equipped with Tucker Poles. These water-fed poles allow our Gorillas to reach glass, frames and sills up to four storeys without taking our feet off of the ground.